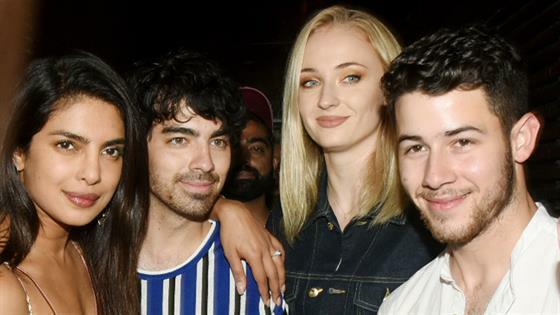 Joe Jonas and Sophie Turner Fire Back After Priyanka Chopra Called a "Scam Artist"
UPDATE: The author of a controversial op-ed that was scrubbed from New York Magazine's The Cut has issued an apology to Priyanka Chopra and Nick Jonas. "I want to sincerely apologize to Priyanka Chopra and Nick Jonas, and to the readers I offended and hurt with my words," Mariah Smith said in a statement posted to Twitter. "I do not condone racism, xenophobia, or sexism. I take full responsibility for what I wrote, and I was wrong. I am truly sorry." Joe Jonas and Sophie Turner did just that on Tuesday after New York Magazine's The Cut published an article called, "Is Priyanka Chopra and Nick Jonas's Love for Real?" In the critical, skeptical post, the author took aim at the newly married Bollywood star and Jonas' new sister-in-law, calling her a "global scam artist." "At times, marriage can be a beautifully wonderful union that warms even the coldest of hearts, but sadly, this union evokes no such feeling," the post read, according to screenshots captured and published online. "All Nick wanted was a possible fling with Hollywood's latest It Woman, but instead he wound up staring straight at a life sentence with a global scam artist." "Nick, if you're reading this, find that horse and gallop away as fast you can!" the original article concluded, according to screenshots of the work. The groom's older brother wasted no time condemning the piece. "This is disgusting. @TheCut should be ashamed to have someone write such evil words," he tweeted. "What Nick & Pri have is Beautiful Love. Thank u, Next." Jonas' fiancée and one of Chopra's bridesmaids, Sophie Turner, also fired back at the work, tweeting, "This is wildly inappropriate and totally disgusting. Very disappointed that The Cut would give anyone a platform to spew such bulls--t."
The post was later updated with the concluding sentences—including the "scam artist" claim—edited out. Ultimately, however, the copy was removed from the website altogether. "Upon further editorial review, we found this story did not meet our standards," an editor's note on the article's original page read. "We've removed it and apologize."